62 pages. 12 x 9 inches. First published by Tecla in 1983, reprinted 2005. 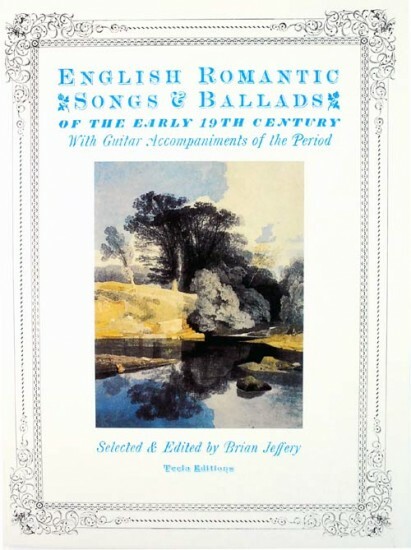 English Romantic Songs and Ballads is a selection of 17 splendid songs in English from the early 19th century, with guitar accompaniments from the period. Re-engraved (not facsimile). The contents of Songs for Voice and Guitar are as follows. a, b, c, and so on up to g: this means from the a four notes below the treble stave, up to the g which is on the second line of the treble stave. a', b', c', and so on up to g': this means from the a which is on the second space of the treble stave, up to the g which is on the space just above the treble stave. a'', b'', c'', and so on: this means from the a which is on the line immediately above the treble stave, upwards.